Thanksgiving may be 2 days away for those of us located in the US but Christmas is quickly approaching (it is only a month away)! Thanksgiving tends to symbolize the beginning of the Christmas Season. Christmas can be a magical time of year. It does not matter where you are in the world, there is always a special feeling of excitement as the calendar moves closer to December 24th and 25th. Christmastime in Europe takes on another level of excitement – Christmas Markets! Almost all major cities in Europe have Christmas Markets but there are a few that stand out above the rest: Copenhagen’s Tivoli Gardens Christmas Market, Vienna’s ‘Christkindlmarket’, Brussels’ Plaisirs d’hiver, and Prague’s Christmas Markets seem to have some extra magic to them. Some of these markets have been around for hundreds of years and while their names and locations may have changed, the spirit of Christmas has remained. 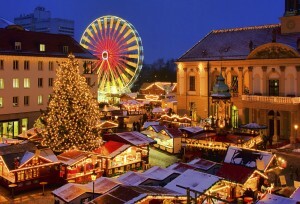 So this year, while you rush to find your loved ones the perfect gift, look to see if your city has a Christmas Market. This way you can give back to members of your community as well as give your loved ones a unique gift. 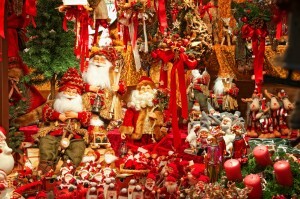 Almost everything, from food to ornaments, found at a Christmas Market has been hand-made by the people selling it to you! Food tastes better while you are browsing at the amazingly hand-crafted wooden nutcrackers. Immersing yourself in Christmas Markets in foreign countries opens yourself up to more than just experiencing a new culture, you are experiencing traditions that have been passed down for hundreds, even thousands, of years. Christmas is a widely shared, yet extremely intimate holiday. There are so many special traditions and stories that are shared by families and cities alike. This entry was posted on Tuesday, November 26th, 2013	at 1:33 pm	. You can follow any responses to this entry through the RSS 2.0	feed. Both comments and pings are currently closed.